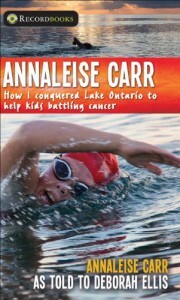 Annaleise Carr is the youngest person to swim across Lake Ontario, and this book is her story. Already a competitive swimmer, she was inspired to raise funds for Camp Trillium, a camp for children with cancer and their siblings, in Canada, when she was told she was too young to volunteer at the camp. This is the story of Annaleise's remarkable swim across the lake, how she derived strength on this arduous journey by thinking about the kids she was helping, and what she learned about herself during the swim. She was very resourceful in raising money for the camp, learned how to be a good public speaker while seeking donations and sponsors, and was blessed to have the total, unwavering support of her family and coaches as she prepared for and actually completed the swim. The book is interspersed with interesting facts about cancer, the Great Lakes, nutrition, Marilyn Bell - "The Lady of the Lake"- and other timely observations, and contains some lovely photographs of Annaleise and her family. The author's voice shines through this tale, and by the end of the book, I felt privileged to have had the opportunity to meet this dedicated, and friendly!, young woman. Her dedication to her cause is an inspiration to any who read her story. While the book is appropriate for middle and early high school age students, it is appropriate for all ages. As an adult, I was captivated. 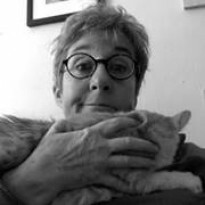 It would make a good read aloud chapter book for middle school classrooms, and it is a book that could be read aloud to younger children. This young woman will go far. She will achieve anything she sets her mind to, and I await her next adventure.